Join us at Escap-ism event at our stall where you can buy our products and a signed copy of A Little Book of Craftivism by author Sarah Corbett. The Escape-ism campaign creates a Culture of Expression, bringing an opportunity for creative communities and people to share their energy & making it a positive exchange, is part of our intention to grow and share this with as many people possible. We hope to offer a space where we honour and value the personal and collective ways through which people can express the world they feel and see. 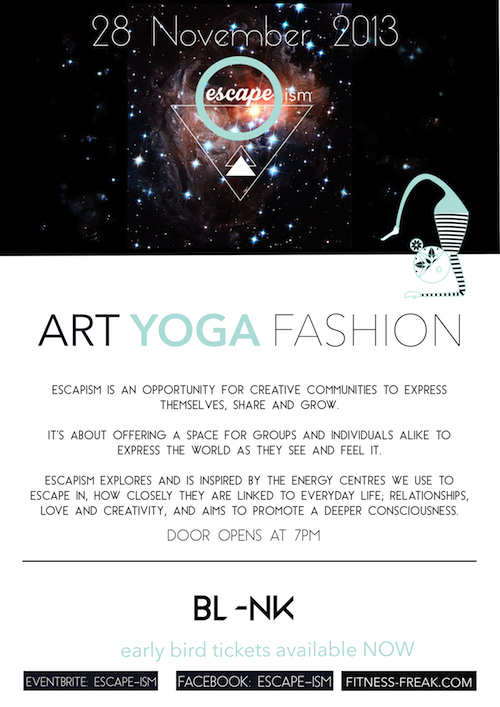 Join us for an eveing of Rocket Yoga, Fashion, Art. The door of the event opens at 7pm, and finishes at 11pm. Interaction of Creative Communities, including refreshments with live DJ.